Take a tour of Riverdale. Riverdale is nestled along the Hudson River between Spuyten Duyvil on the south, Yonkers in the north and Van Cortlandt Park on the east. With its curving, quiet lanes, spectacular views of the New Jersey Palisades and spectacular estates, it seems to be more a part of suburban Westchester. The New York Times real estate section seems to agree: it has famously listed Riverdale separately from the rest of the Bronx for years. Yet, Riverdale has been a part of New York City since 1874, and the numbered street system that begins with East 1st Street in the East Village extends to the city line at the Yonkers border at the highest numbered street in the series, West 263rd Street. Much of Riverdale and Fieldston, the adjacent semi-private neighborhood, was a forest owned by War of 1812 veteran Major Joseph Delafield, who in 1829 purchased 312 acres in the area west to the Hudson River and built a lime quarry and kiln. His son Edward constructed an elegant mansion that he named Fieldston Hill (which still stands on West 246th Street), and the major’s grandsons brought in architect Dwight James Baum, who designed dozens of homes in Riverdale and Fieldston in different styles. Fiorello LaGuardia was a Fieldston resident and read the comics on the radio during a newspaper strike from his study on Goodridge Avenue. John F. Kennedy lived in a house that still stands on Independence Avenue and West 252nd Street when he was a boy, between 1927 and 1928, when family patriarch Joseph Kennedy briefly moved his family to Riverdale. The story of Van Cortlandt Park begins in 1699, when future NYC mayor Jacobus Van Cortlandt bought a large tract of the Frederick Philipse's holdings in the northern Bronx. New York City obtained the land in 1888 and committed much of it to parkland. Van Cortlandt Park is marked by rocky outcroppings made mostly of gneiss, a metamorphic rock with a distinctive banded texture. Streaks of mica can be found in the rocks, as well as quartz. Van Cortlandt Park's Northwest Forest contains the park's older-growth trees, featuring hickories, beech, cherry birch, sweetgum, red maple and of course, the incredibly tall and straight tulip trees. Fauna fans won't be disappointed either as owls, bats, chipmunks, woodchucks and large gypsy moths, rabbits, raccoons, opossums and coyotes can all be found here. The 1997 John Muir Nature Trail as well as the Putnam Railroad and Croton Aqueduct Trails run through the park. 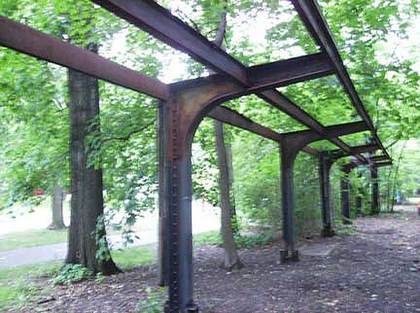 There’s a park trail in Van Cortlandt Park that was once a railroad. It can be reached by walking east through the park from the E 242nd Street stop on the #1 subway line, the last stop. When you reach an overpass, climb onto it: you have reached what is now the Putnam Trail. The Putnam Branch, or "The Old Put" as it's called, originally ran from Sedgwick Avenue in the Bronx north to Brewster, New York on the NY Central commuter line, now called the Metro-North. It diverged from the Hudson Line just south of West Kingsbridge Road. Passenger service ended on the line in 1958, and the last fright train rumbled on the now-missing tracks in 1980. Follow the Putnam Trail just north of that overpass (which is marked with the date it was finished, 1909) and you will arrive at the skeletal remains of the Van Cortlandt station. It throws shadows on the trail reminiscent of train tracks. The Putnam once let passengers out in the middle of the park, which was quite a convenience in the good weather months. Just north of the old station the trail bridges over Van Cortlandt Lake, the largest freshwater lake in the Bronx. The trail continues through the park and north into Yonkers. Van Cortlandt Manor, a Georgian-style country house made in the fieldstone style was built in 1748 for Frederick Van Cortlandt. The vast athletic field north of the mansion was at one time the Van Cortlandt farm, and had large planting fields, livestock, and a grist mill. 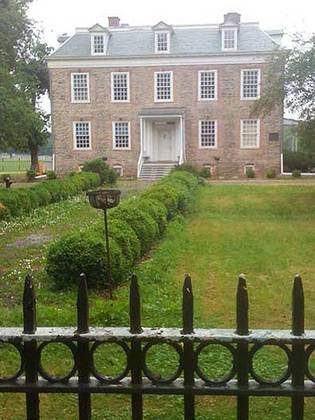 George Washington used Van Cortlandt Mansion as a headquarters during the Revolution. The house is maintained by the National Society of Colonial Dames as a museum appointed with period Colonial and Federal collections. It is open to the public. In back of the mansion, you will find William Clark Noble’s 1902 bronze of General Josiah Porter (1830-1894). General Porter was the first Harvard College graduate to enlist in the Union army during the Civil War. As a captain he commanded the 22nd Regiment of the NY State National Guard in the war. He rose to adjutant general in 1886. It may look like a back alley or driveway but this lane running from West 251st to West 252nd just west of Broadway is one of New York State’s most historic routes. The Old Albany Post Road is the former route used in the colonial era to bring mail from New York City north to Albany, hence its name. This is a one-block dirt road remnant of the ancient track. In the 19th Century, the Old Albany Post Road would be straightened and would become the roads we know today as Post Road, and the much longer Route 9, which encompasses Broadway in NYC and further north, known as the Albany Post Road. Route 9 goes all the way to the Canadian border. 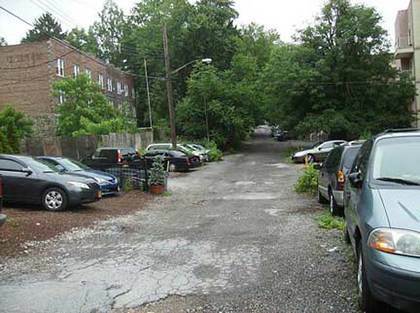 A further remnant, Albany Crescent, can be found in neighboring Kingsbridge Heights, and a much longer 6.6-mile dirt remnant of the OAPR remains in upstate Putnam County. Brothers George and William Hadley built the center section of this 2-story colonial on Post Road just north of West 251st Street in the mid-1700s, making it just a little younger than the Van Cortlandt Mansion. In 1777, the Hadleys used the house as a garrison for a corps of volunteers serving the patriots’ cause. 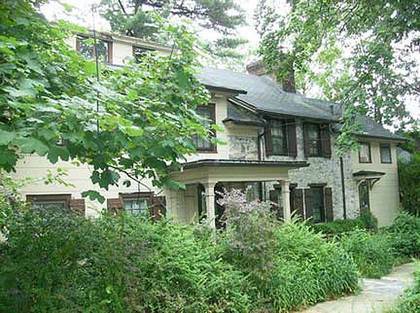 In 1829 it became the property of Major Delafield, along with much of the rest of Riverdale and Fieldston. In 1915, Dwight James Baum, who had a hand in so much of Riverdale’s architecture (his signature piece is the Riverdale Bell Tower in Spuyten Duyvil at Riverdale Avenue and the Henry Hudson Parkway), remodeled the Hadley house, adding wings to the north and south. Baum was careful to maintain the house’s original features. Riverdale is where a lot of very rich liberals live, and tell people they live in The Bronx (which is technically true), expecting a fist-bump from friends, who are then off to the bar to get a round of $22 margaritas.